I need something to hold my cellphone, glasses case, debit card, and lipstick when I’m vintage shopping or at a music festival. My aging eyes require prescription sunglasses now and I like to have my cell phone close by. Room for a couple of other small items would be nice. It needs to be cross body as not to aggravate a shoulder worn out by heavy diaper bags, camera bags, and much-too-big purses for too-many-years. You see where I’m going with this. 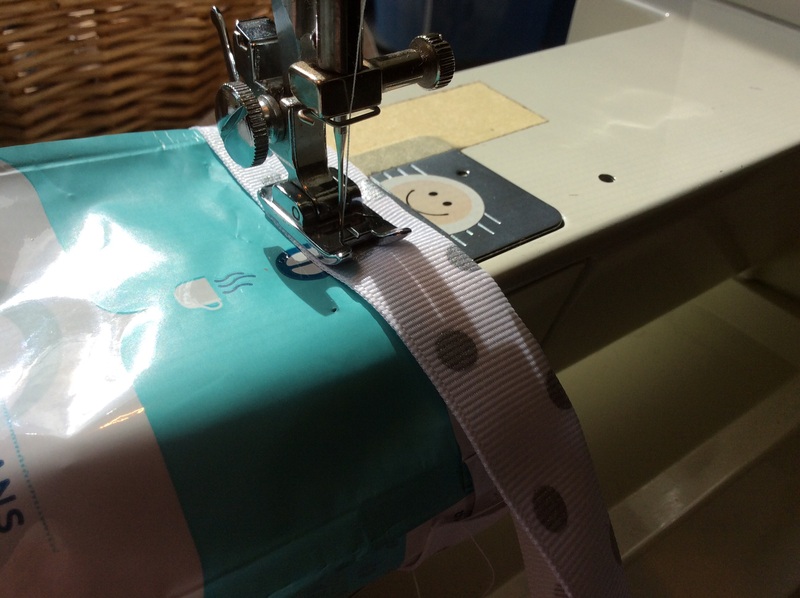 Skills needed: straight line sewing on a sewing machine, a little hand stitching, and button sewing. 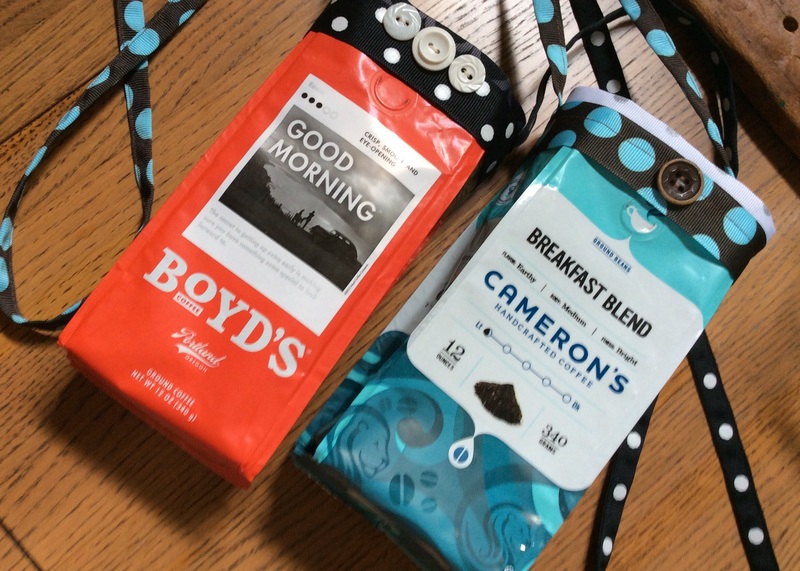 Thoroughly wash out the mylar coffee bag in warm water and soap. Air dry completely. Gently remove any tape tabs or plastic/wire closures. 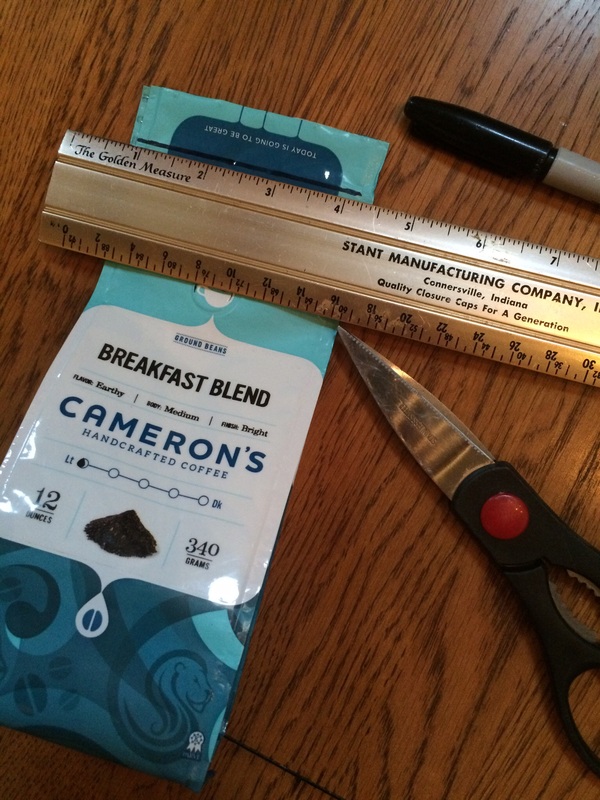 Using a straight-edge and a sharpie pen, draw a straight line squarely across the top of the bag. The size of the finished purse is totally up to you. Mine is around 7-1/2 inches deep so that it can accommodate my glasses case. 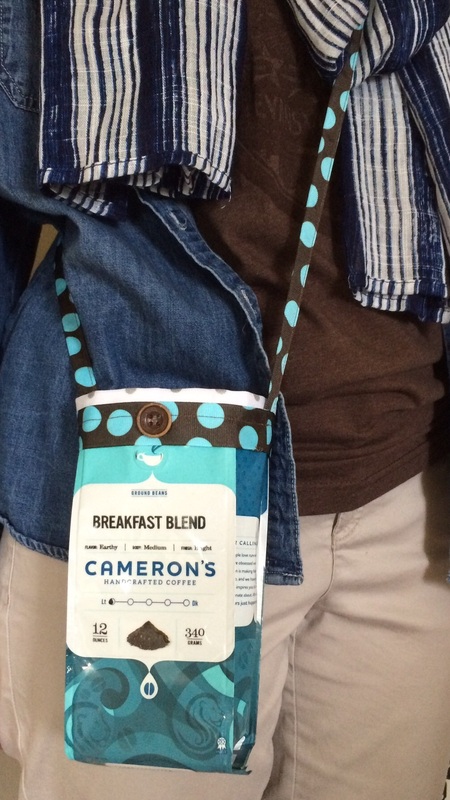 Pay special attention to the location of the “freshness button” on the front of your bag. 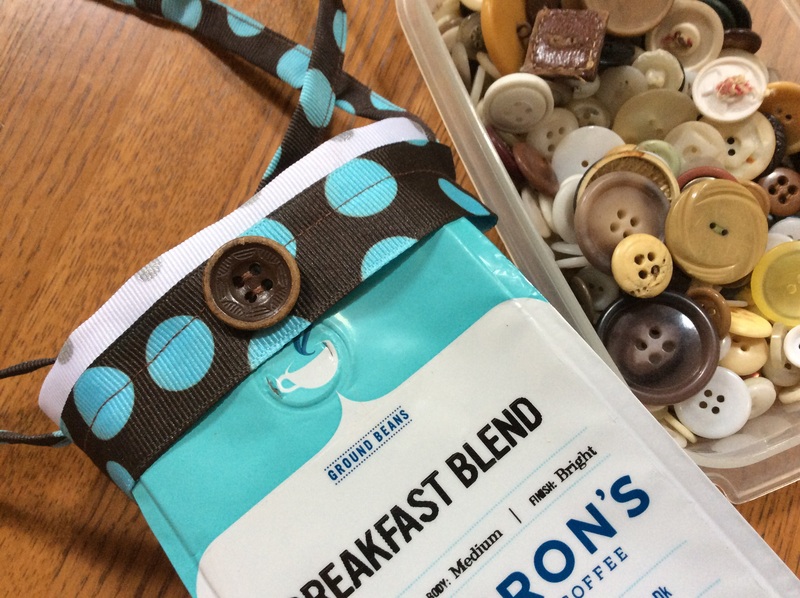 Different brands locate this button in different areas and you want to make sure that the button is not too close to the top of your bag as to prevent your sewing across the top. Keep the button at least an inch from the top of your finished purse. Next, grab some ribbon from your stash. Chief and I share this workspace. 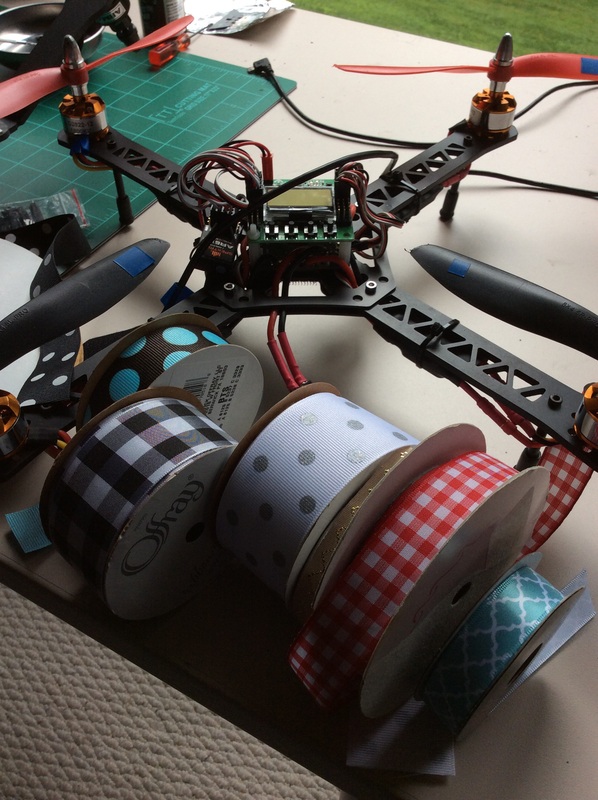 That’s the quad copter he’s building. 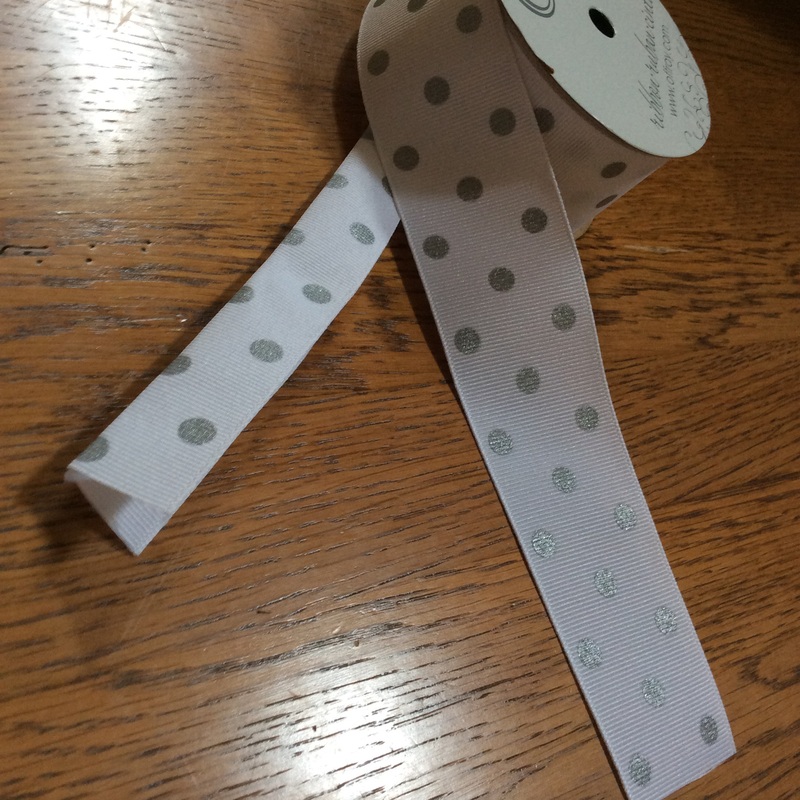 I prefer grosgrain ribbon because it feeds through the sewing machine easily and stitches well. Have fun with this part, matching the colors on the particular bag you are using but mixing up patterns. I love to mix dots and stripes, or stripes and checks, or geometrics and metallics. Here’s your chance to be really creative. Using the wider of the two ribbon pieces that’s about 12 inches long and your iron, fold and iron the ribbon in half, lengthwise. 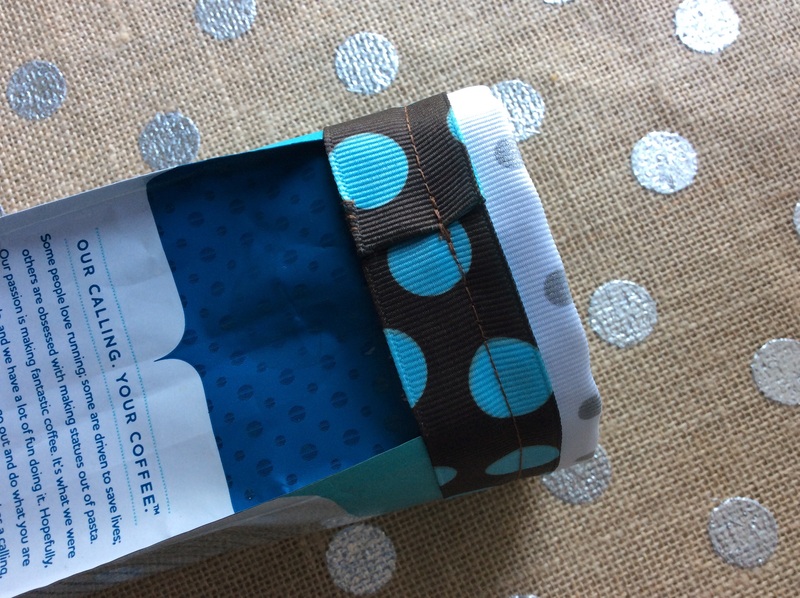 Place this ribbon on the top of the bag with the folded edge snuggly against the cut edge of the mylar bag. 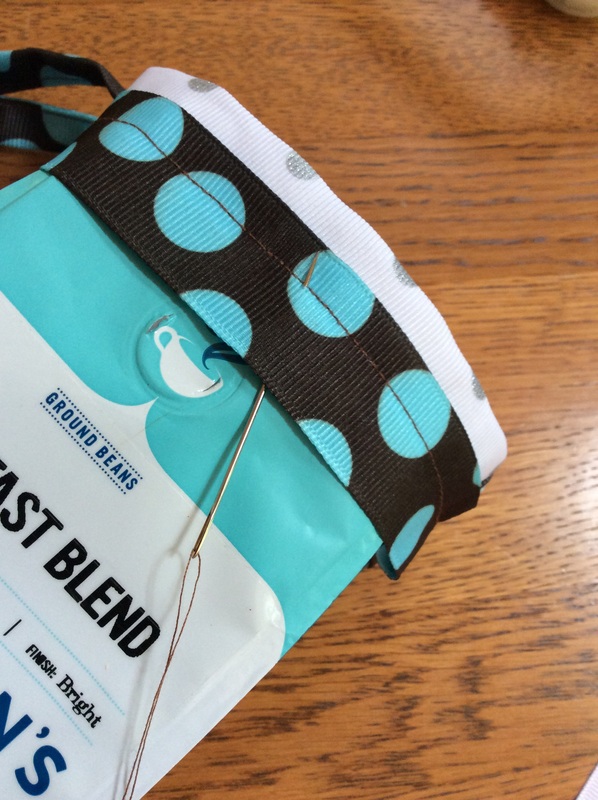 In other words, the cut edge of the coffee bag is sandwiched in between the “V” of the ironed ribbon. Start and stop this ribbon placement on one side of the bag. Pin in place. 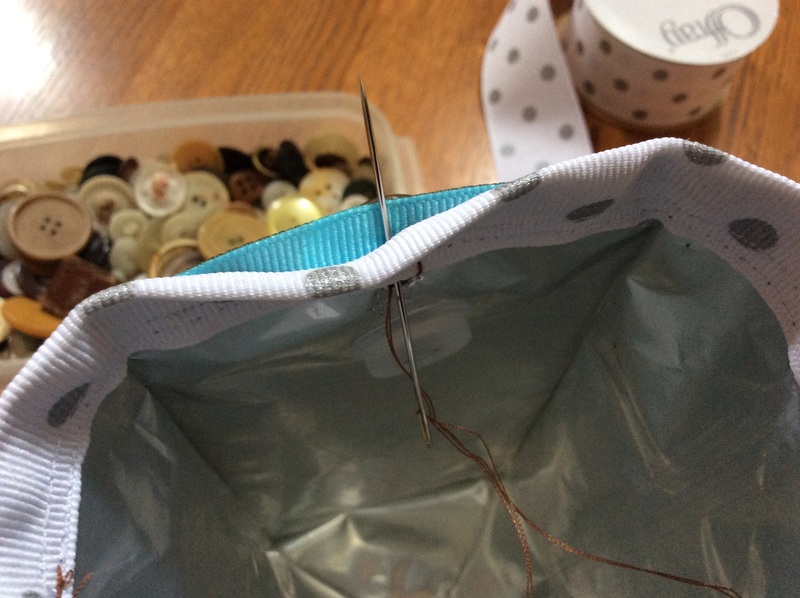 My sewing machine has an arm that perfectly fits the diameter of the bag and allows me to sew on the right side or outside of the bag. If your machine has no arm and only a flat surface, you may face more of a challenge; you’ll need to sew from the wrong side, working the bag around your presser foot. Sew a few stitches, re-adjust the bag, sew a few more stitches. This takes a little more precision but it can be done. Onward. 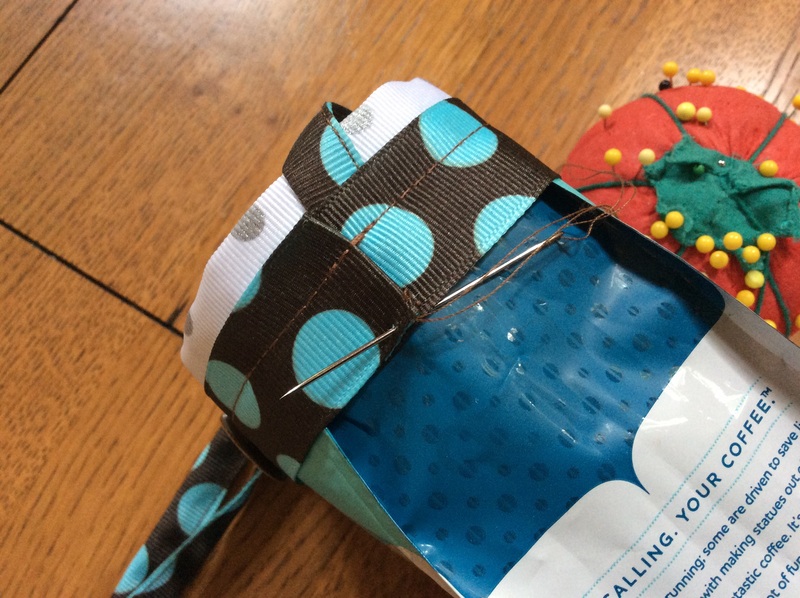 Sew this first ribbon piece with your line of stitching approximately 5/8 inch from the folded edge, securing the bag-edge inside the fold of the ribbon. This finishes off the top edge of your bag. To neatly finish the cut edge of the end of the ribbon, fold and finger press the edge so that no raw edges show and continue sewing to the end. Because I like true craftsman-style crafting and believe that workmanship matters, I match the thread color on the machine to this ribbon even if it means that I’ll need to change the thread color for the next ribbon choice. For this example, I used white thread for the white with silver dot ribbon, and brown thread for the brown with blue dot ribbon, keeping the bobbin thread white. In a minute, you’ll see why this detail is important. But only if you’re super picky, like me. 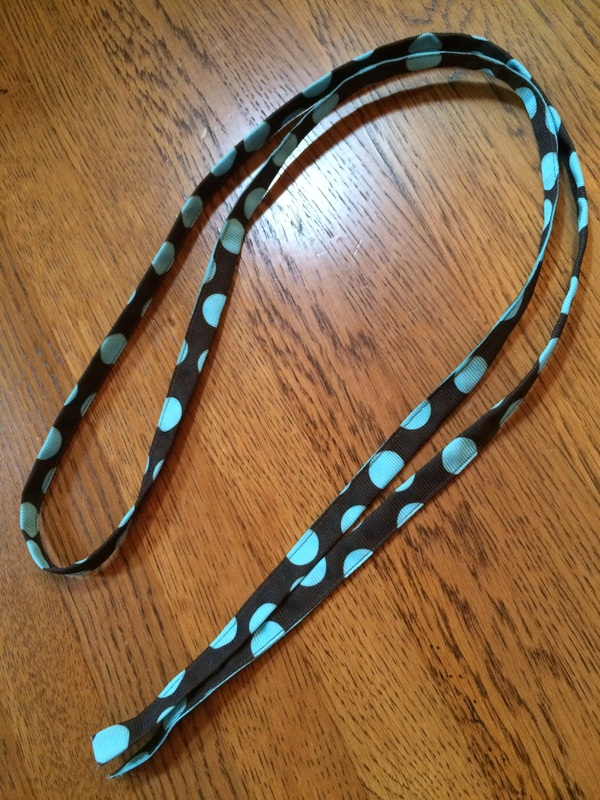 Next, cut the longer ribbon piece into two pieces: one 12 inches long and the other 36 inches long. Fold the longer piece in half lengthwise and iron. This will become your strap. 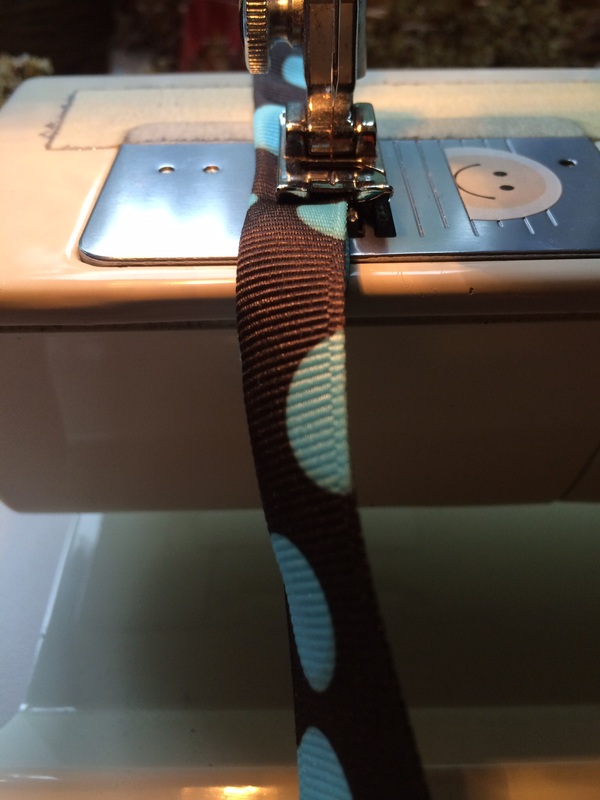 Stitch this strap along the open edge of the ribbon using a straight line stitch on your sewing machine. Now pin the strap to each sides of your bag being careful not to twist the strap before you pin each side in place. 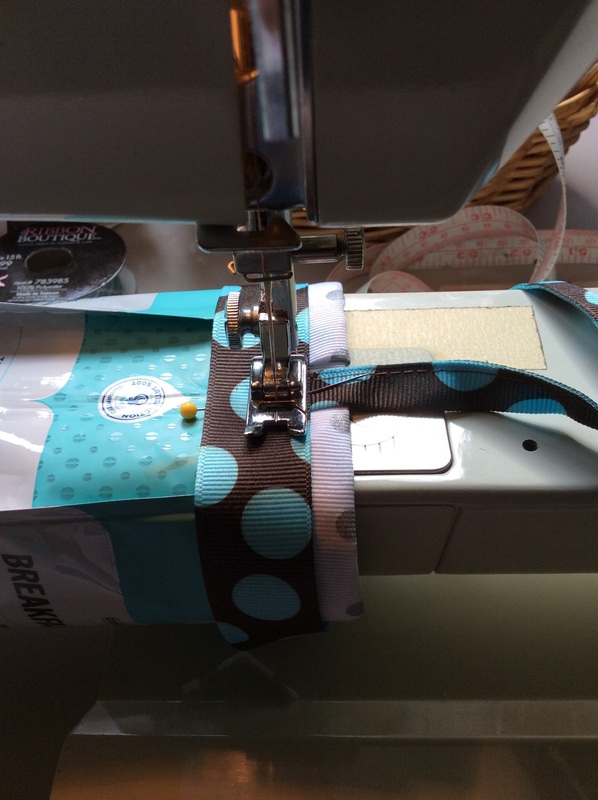 You may go ahead and tack the strap into place with a few stitches, or just layer on the next ribbon and sew it in one pass. 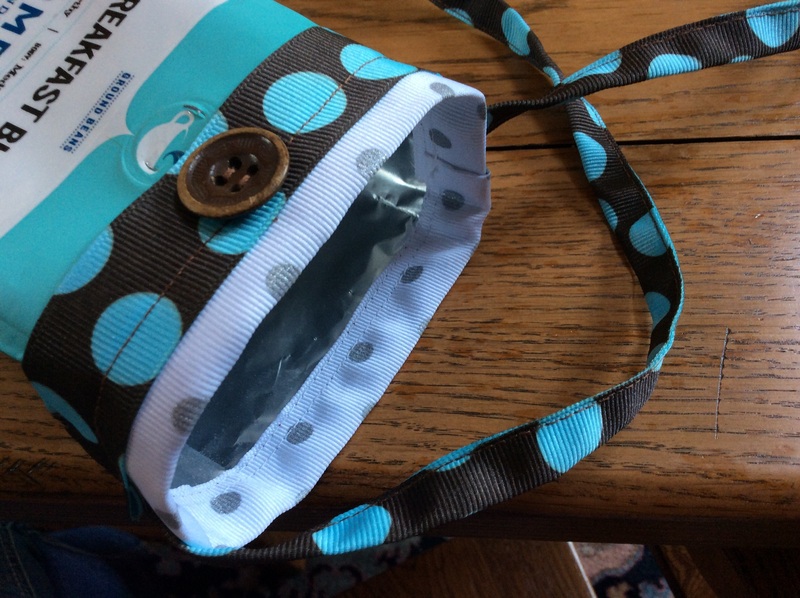 Using the final piece of ribbon, cover over the strap ends as you pin the top ribbon to your bag. Again, start and stop on one side of the bag, preferably the opposite side than you used before. 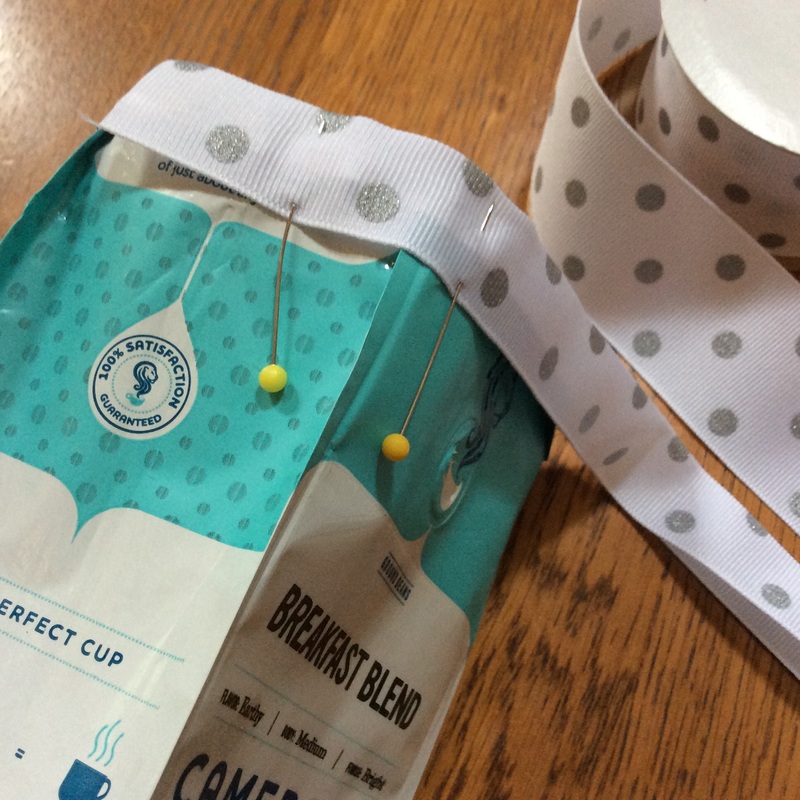 Pin the ribbon in place and follow with careful stitching. This step hides the ends of straps and provides more design and texture. On my example, the second ribbon is placed 1/4 inch down from the top edge, and the stitching is 5/8 inch from the top edge. As with the first ribbon on the bag, fold and finger press the raw edge of the ribbon to finish it off, back-stitching just a little to lock it in place. Notice that I switched the top thread color to brown, but kept my bobbin color white. When finished, the inside looks nice and neat with white thread on the white ribbon. As my Granny would say about dressmaking, “You should be able to wear it inside-out and nobody knows the difference.” What she meant by that is that there is a certain level of satisfaction in keeping everything neat and tidy all the way through, even on the inside and even if no one will ever see it. This is the difference between something that’s acceptable and something that well-crafted. We should always strive to be outstanding. That’s your lesson for today. Plus, you never know when you’ll put your shirt on wrong side out. and then go to your vintage button jar and select the perfect decorative button for the front. 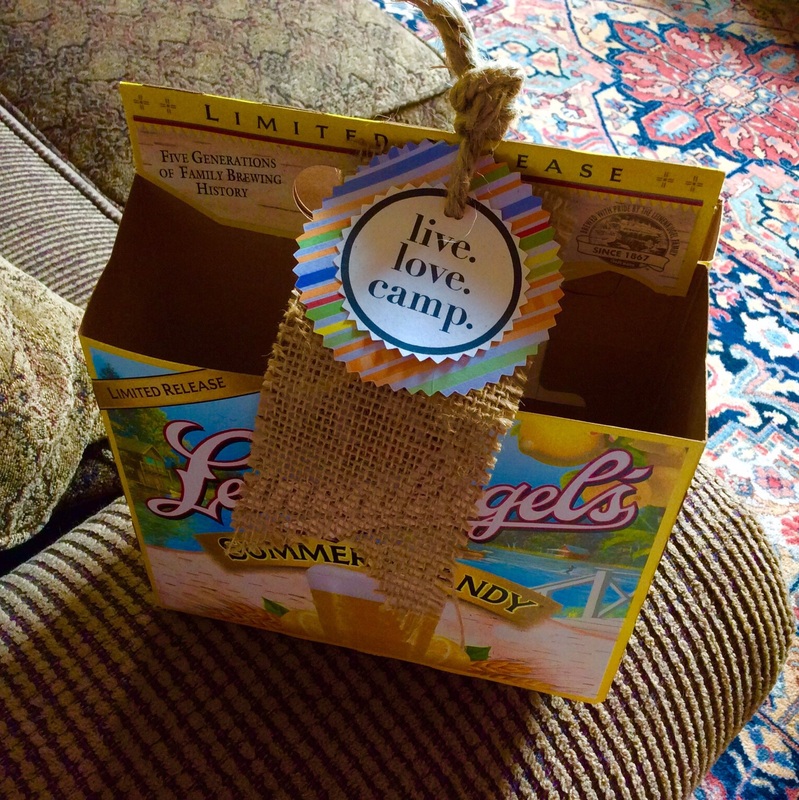 Don’t have a vintage button jar? Check out your stash of button packets that come with clothes you buy, or cut a button or two off of a garment headed for the rag bag. Be resourceful. For this bag, I chose a coffee-bean colored beauty. There now. Stitch that button, or two or three, to the center front of your bag. Here’s another tip. 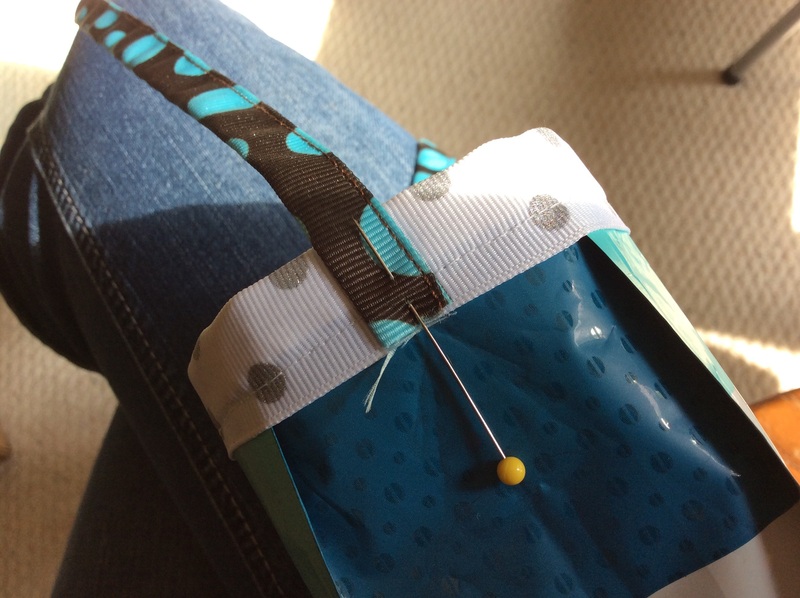 Hide the knotted end of your thread under the flap of ribbon by bringing your needle under and through. Slide your final knot under the flap the same way. No ends poking out! Perfect! There you go. I love the black and white photo on the orange bag and the name on the other….a favorite of mine. Slip in the Warby Parkers, iPhone, and my debit card and I’m good to go. See you at Ed Sheeran next week and the fireworks on the 4th!